Money Saving Strategy Games That Will Save You Money Now! Have you dealt with financial adversity? Struggled with unexpected expenses, got laid off from your job, or like me have managed to keep your job but haven’t had a raise in six years? As promised earlier this week on my Facebook page I will be sharing lots more posts about saving money and frugality this coming year! Are you not enamored with coupon clipping? Don’t have the time to shop all of the grocery stores? Do you get tired of keeping up a price book? Here is a little game I play called “How Low Can You Go” it should also be called “How Long Can You Go?” as well. Since I work in a 10 month job for the school system one of the things I do is see how long I can go without buying something or how low I can get a price on something for and I also sell a bunch of stuff so I could also call this post “How Much Can I Get” but you get the point though. There are other fun games to play though like my friend Mr. CBB at Canadian Budget Binder’s Grocery Game. Just remember these are my strategies many of you already have your own but I love to challenge us to new goals each year and remember to visit new money-saving sites to keep adding to your wealth of money-saving ideas! Here are some of my strategies in the How Low You Can Go Game. Buy meat when it’s on sale and stock in freezer. Make your own broths for soups, stews, and other recipes. Purchase paper towels when they are on sale with free shipping on Amazon or don’t use paper towels at all and re-use home-made napkins. Don’t like to sew you can always go to thrift stores and find cloth napkins for sale. Grow your own garden veggies and food from garden scraps and eat as many garden recipes as you can. Make your own pet treats. If you do eat popcorn make sure you pop it from scratch it is much cheaper and healthier than microwaveable options. Here are also some of my strategies on the How Long Can You Go game. I purchased hand soap in bulk and I am at the end of it but it has lasted me almost two years although I do put out holiday soap I receive as gifts every year too. Buy other items in bulk that you use frequently in our case we love mushrooms so that would be an item we would buy in bulk. Trying not to purchase new bath towels just trying to see how long I can go but usually once they start getting holes I donate them to a local animal shelter. Fix your own appliances and try to learn new skills in other words how long can you keep that toaster lasting? Can you mix and match different clothing so you can continue to use clothes you already own? My husband recently oiled, sanded and glued all of our cutting boards getting them all in tip-top shape for lots of use for our Lil’ Suburban Homestead. Keep reference books you own in your library they may come in handy one day and you can loan them to friends and family rather than purchasing new books in the future. Save left over veggies for other fun recipes like mystery soup or a yummy frittata! I realize these are only a few strategies and ideas but I hope that you will try one of them or all of them or share your favorite strategies with me! Have a great week everyone! Haha, I like that idea and in reality I think we already do that without trying. We do try and see how long we can go without buying something or we wait to see if we can get the best price on something even if it means we wait a few months. It’s smart in my opinion. I’d love to have some more fans from around the world join The Grocery Game Challenge. We have fans from Canada, USA, Guatamala and more!! Come check it out and karen, thank-you! Mr. CBB I really think the one that always fascinates me is how long we can actually go without buying certain things most people buy stuff because they want something new and when I see people that go to the stores and I see them with the huge candles I think well I can’t wait because your candle after you burn it a few times you will be bored of it and then it will be at the thrift store for me the difference is they pay $15.00 for it and I pay about a $1.00 and that’s when I am feeling spendy! Your grocery game challenge is awesome I hope others hop on over to your site and check it out. Have a great day! Saving money with groceries: the garden helps lots and I practice Zero-Waste cooking which helps bunches as well. With regard to household goods I firmly believe in buying quality instead of cheap – you can spend so much more buying & re-buying things that are too cheap to really work well in the first place! I use Mr CBB’s grocery game challenge to help keep the grocery bill down and I just love leftovers!!!! I have a few recipes that use up the leftovers. It’s amazing what can be mixed into pasta, soup stock, rice or eggs to make a meal with those yummy bits and bites!!!! Christine I don’t know if you have ever read The Tighwad Gazzette and that’s when I learned about using leftovers but whats awesome about Mr. CBB’s game is that it is so current and relevant I really enjoy it too I should participate more 🙂 Thanks for sharing! I have made mystery soup for years since my kids (now mostly in their 40’s) were tiny. I keep a container in the freezer for leftover cooked meat bits, leftover cooked veggies, etc, a plastic zip-lock bag for meat bones, make my own beef and chicken broth and freeze in 2-cup lots. Make soup from broth, the contents of the container, extra herbs or onion and some rice or noodles at the end. This time of year, when I can get tomatoes seconds I make tomato base and freeze for use in soup or other combos. Other veggies on sale also frozen for the winter. Making my own stock was the biggest forehead slapper for me when I figured it out a few years ago. Making a nourishing and delicious stock from what is essentially garbage is just a “duh moment”! Thank you so much for stopping in and commenting I so appreciate! I know for years I didn’t make my own stock either and it’s so easy to do! LOL! We also love seeing how low we can go and how long we can go. This year I set a challenge for myself to not buy anything that we did truly need. That meant that buying food was okay but not much else. I love figuring out ways to repurpose what we already have on hand and I love fixing things up. Gift giving has been interesting but quite fun. Using things we already have we have made many, many homemade gifts and people do seem to truly appreciate them. I realized I have hardly bought any shoes this year…….it’s been fun to just wear the same flip flops all summer long…we live at the beach so summer wear should be minimal in my opinion…bathing suit, flip flops, and a big t-shirt 🙂 I love giving home made gifts too so glad you stopped in and trust me sometimes I get the itch to shop and then remember how blessed I am and to be content! So nice to meet you! Great tips on saving money! 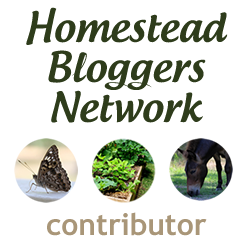 We’d love you to come and link up your article and other future homesteading articles to From The Farm Blog Hop! Thanks for the compliment and for your time stopping in 🙂 Have a great day!